You are the keeper of a dark lord's altar. Legions of knights in shining armour have come to desecrate it. 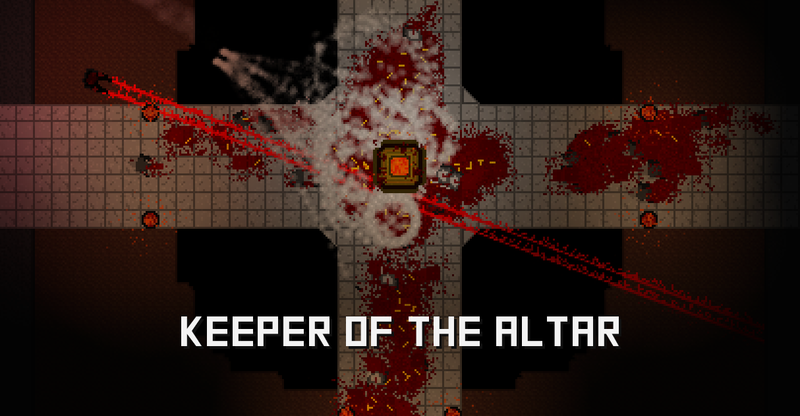 You must protect your lord's altar using a variety of means... including dual-wielded heat-seeking cluster RPGs. Created in under 48 hours for Ludum Dare 37 where the theme was "one room." In each round you defeat waves of enemies; the gold you collect from their corpses can be used to purchase and upgrade your weapons in between rounds. There is also a sandbox mode which begins on the 10th wave with all weapons and turrets upgraded. Click on the altar to access the next wave, and upgrade your gear in between waves. Click on braziers to upgrade to fireball turrets (will cost 15 gold). Collect gold dropped by enemies to purchase upgrades. All source and assets are licensed under the zlib/libpng license.